The Pecan Street Inn Bed and Breakfast is an elegant turn-of-the-century Victorian home. This Bastrop, Texas bed and breakfast is listed on the National Register of Historic Places and is designated a City of Bastrop Landmark. The Pecan Street Inn has been named Bastrop County's "BEST" Bed and Breakfast the past four years. 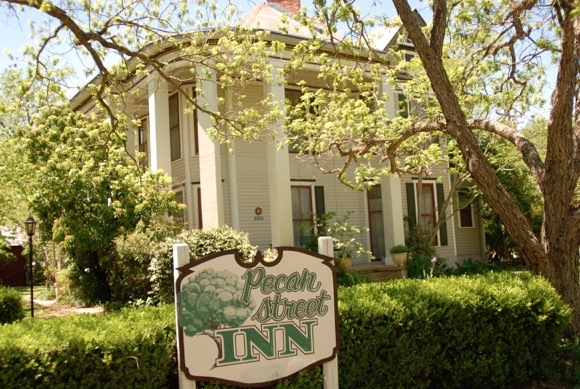 Nestled under a grove of native pecan trees, Pecan Street Inn offers turn-of-the-century Victorian lodging and accommodations for romantic weekends and vacation getaways. The quiet location is at the gateway to Bastrop's tree-canopied Silk Stocking Row lined with National Register antebellum, Victorian and Prairie Style homes. It is only 1-1/2 blocks to historic downtown and 2 blocks to the Colorado River and Riverwalk hike and bike trail. Restaurants, antique emporiums (including the oldest drugstore in Texas, complete with Ice Cream Shoppe), and upscale boutiques are all within an easy walk. The uniqueness of the picturesque little town and its surroundings accounts for the 40+ movies produced here. Beautifully appointed with tasteful American antiques, Pecan Street Inn Bed and Breakfast features romantic fireplaces, elaborate millwork, long leaf heart of pine floors, pocket doors and restored lighting. 12' ceilings, fans, old wavy glass windows with transoms indicative of the Victorian period are found through the Inn. It is not "fussy", though, so guests can relax in the front or back parlors that are stocked with TV/VCR, games, books and toys for the children. Or take your book outside to the big wrap-around porch and sit a spell on the Victorian rockers, sofas and swings. As old as the Inn is, nothing has been spared in its upgrading. A fully equipped country kitchen is available for guests' use, as is covered off-street parking and even a laundry room. An outdoor deck with grill for al fresco dining overlooks the old barn (soon to be renovated) and rope swing which lures young and old. Children and small pets can be welcomed but not inside smoking. Signature gourmet, sit-down breakfasts served at the guests' discretion include stellar main dishes, such as Pecan Waffles with Strawberries Grand Marnier, fruit, and baked goods. All is served on china with silver and crystal in one of the two dining rooms.. Or, if you prefer, you may choose a delectable Continental breakfast served in your room. Of course, carefully selected coffees, teas, and hot chocolates are available as well. Individual diet plans are always cheerfully arranged. Accommodations include king and queen-size bedrooms or suites or acquire the entire home, which sleeps 15, for your personal enjoyment. Many gatherings have been held over the years in the house and on the grounds (up to several hundred outside). Private entertaining, weddings, showers and receptions are comfortably welcomed. Dinner parties, retreats, family reunions, meetings, corporate functions, romantic excursions complete with horse-drawn carriage rides, and even golf and theater packages can be easily arranged. Serious bicyclers bring their own but gently used bikes are yours for the asking.